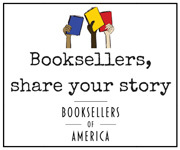 IndieCommerce and IndieLite are ABA’s online platforms for marketing events and author appearances as well as selling books and other merchandise. Both users and non-users of IndieCommerce and IndieLite are invited to schedule a one-on-one time with a program specialist from the IndieCommerce team. Space is limited, but walk-ins are welcome. Sign up here.